This is a story about leadership, which is best lived situationally. In other words, context matters to the way decisions are made and actions are taken. Sometimes—often—good leadership in a civil context requires consensus building, but sometimes history calls for something quite different from us. 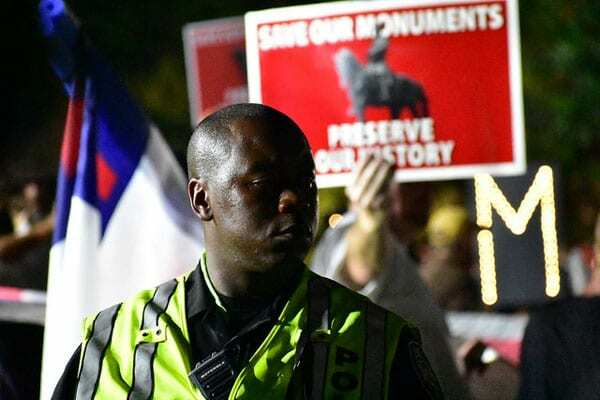 On the night of August 20th, students of the University of North Carolina at Chapel Hill and outsiders tore down the Confederate monument known as Silent Sam. Gifted to the University by the North Carolina division of the Daughters of the Confederacy in 1913, Silent Sam has been a controversial issue for decades. That night, protesters had enough and showed their solidarity with previous protesters—including Maya Little, who doused the statue with a mix of ink and her own blood earlier this year—by tearing it down. He went on to say, “At the end of the day, people have their rights to have their views and opinions and that’s what makes America great—but there’s a law in place there, too.” The law to which he refers actually forbids taking down public monuments without the approval of the North Carolina Historical Commission. However, Gov. Roy Cooper gave permission to all university officials to make an executive decision about the statue if there was a real risk to public safety, but UNC chose not to. Recently, Chancellor Folt invited public comment on the fate of Silent Sam. The university has set up a dedicated email address for anyone to submit ideas about the statue’s future. So, why is Smith complaining? After many decades of controversy, the administration is finally addressing the issue. Chancellor Folt’s letter to the university demonstrates she has heard not only the voices of the board, but those of her students, faculty, and the public, and is working to come to a resolution. Tensions on campus remain, as shown by a clash between Defend UNC Group and the New Confederate States of America that took place on September 9th on the UNC campus, leading to the arrests of eight people, adding to the list of more than a dozen individuals arrested in the connection with the toppling of Silent Sam and other protests. (Eleven of them had their trial dates postponed yesterday.) The incident escalated when the campus police escorted the New Confederate States of America members off campus, prompting the anti-Silent Sam demonstrators to turn on them for “protecting a group that represented hate,” as Janine Bowen of WRAL describes it. The numbers show that African Americans are still a minority at UNC, and a sign of true welcome may lie in part—or at least symbolically—in the fate of Silent Sam. According to the Office of Institutional Research and Assessment, there are currently 1,466 total employees and 2,340 students who are African Americans, compared to 8,051 total employees and 18,352 students who are white. Their minority status is seen in the lack of concern for their emotional and physical health if Silent Sam were to remain on campus. It is reflected in the outrage at the thought of removing Silent Sam from campus. It is seen in the lack of comments and feedback from African Americans in news articles about Silent Sam. It is seen in the desire to keep Silent Sam on campus and add to the subtle, but present, racial hostility on UNC campus. It is clear in the quintessential leadership decision that must be made.